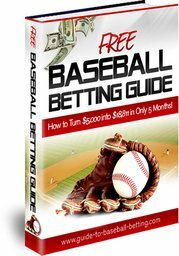 Winning Baseball Betting Systems ... FREE! Winning baseball betting systems and sound money management are critical to your long-term success betting on baseball and other sports. What makes sports betting different than other gambling activities is that sports are played by humans and humans, like you and me, hate to lose. Sports betting systems can help you find teams that are extra motivated to win! It is important to note that a win percentage by itself is usually very misleading. 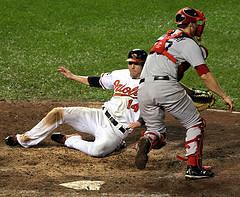 For instance, System #1 in the Free Baseball Betting Guide produced an overall 67.7% win percentage in 2011. However, the average odds for all games was -163, meaning that you would need a 61.98% win percentage to break even. We encourage you to resist the temptation of slick marketing campaigns and slimy salespersons whose sole purpose is to steal your money. They do not care if you make money; only that “they” make a lot of money. Read about a few popular Online Gambling Scams. Instead of getting other people rich, take the time to learn about baseball betting systems so that you can cut out over-priced, under-performing handicappers. If you would like to learn how you can develop your own betting strategy or if you just want to know how to become more profitable at sports betting, visit MLB Betting Tips. Smokin' Hot Baseball Betting Strategy is based on a common sense approach that a “stronger” MLB team “playing better” right now, whether playing at home or on the road, will win at least one game of the first two games of a three or four-game series. Avoid the Series Sweep focuses on teams who are trying to avoid the embarrassment of being swept. Dominant Home Team. The simple premise of this system is that dominant teams rarely get swept at home. Dominant Team Over Last 3 Years. This simple system finds matchups where one team has a dominant win-loss record over the last three years in the same ballpark. Vendetta System helps to predict when team will be extremely motivated to play after being swept. Baseball Totals System is extremely easy to play with lots of action, as there are usually plays every day. Top 20 Starting Pitching Dogs is a simple strategy that shows the importance and value of starting pitching. It demonstrates why you should be cautious when betting against good starting pitching, especially if the oddsmakers deem their team as the underdog. Monthly Income Sports Betting System allows you to set a "salary" for yourself that you'd like to make entirely by gambling on sports each and every month. And best of all, you only have to pick 40% winners in order to earn your salary. Check back here often as we will be adding new Baseball Betting Systems over time.